Videx GSM Intercom For Electric Gates. VIDEX 4K1S GSM Intercom System. Videx GSM door entry system employing mobile phone technology to communicate and operate doors and automatic gates. Based on the 4000 series door entry panel design, the GSM amplifier is totally self contained and only requires an external power supply and an antenna while having the flexibility to combine with full range of the 4000 series module features. Capable of multiple doors, coded access, proximity access and bio-access features. 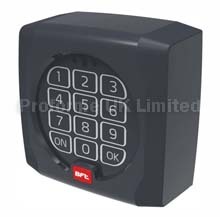 Available from a 0ne button kit to a ten button system, all having up to 250 built in access codes. This allows the user to call the entry panel and activate the lock output relay at no charge to the caller. Each button on the door panel can be programmed with two phone numbers, allowing the system to divert a call if the first number is busy or not answered. Download GSM Datasheet PDF File. Here. Download GSM Manual/ Instructions Here.